Taking a week off in the US, I’m in the Chicago area, visiting an old friend and fellow modeller, Dean Milano. Dean lives very close to one of Chicago’s largest hobby stores, Al’s Hobby Shop in downtown Elmhurst, so one of the first tasks is to drop by, and it’s strange how things turn out. 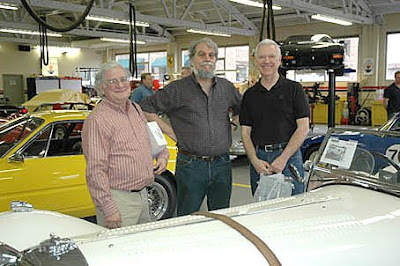 A casual conversation with Jeff Clark in Al’s has him asking, “Are you going to the Ferrari show?” This, it transpired, was being held at a Ferrari, Maserati, and other exotic machinery, showroom in Hinsdale, due south of where we are staying. So Dean and myself duly set off on Saturday. It was a smallish event, but the showroom had put aside a room for model dealers’ tables, and as one does, you start bumping into a number of people you know. 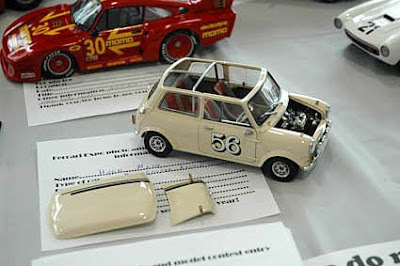 A small model competition was being held, featuring cars that were not necessarily Ferrari, Maserati, or even Italian – there was a nice Tamiya Mini for example. You also got a chance to visit the showroom workshops, where a range of exotic vehicles could be maintained in surroundings which were clean enough to eat your dinner off! And pride of place (shown above) – probably an S-100 Jaguar, right-hand drive and all – just to show those Italians a thing or two. 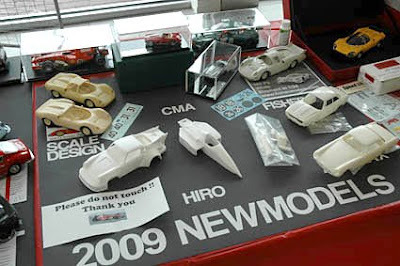 The pictures show (top to bottom) a Tamiya Mini competition entrant; new resin kits; Dean Milano (middle), with Bill Lastovich of Revell-Monogram (left) and Fred Cady, of Fred Cady Decals. In front is half a million dollars-worth of full-size Jaguar SS-100. Fred is now retired, and these pictures were posted as a tribute.